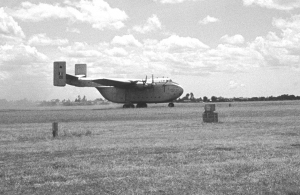 Slab-sided and angular, the Blackburn Beverley never won any beauty contests, but it’s ability to carry bulky loads into short roughly prepared airstrips was almost unsurpassed. A remarkable characteristic considering that at the time of it’s entry into service the Beverley was the largest aircraft ever delivered to the RAF. The origins of the Beverley lie in a series of design studies carried out by General Aircraft Ltd (GAL) in 1945, looking at the problems of large cargo-transport aircraft. During World War 2, GAL had been responsible for the design of the huge Hamilcar tank-carrying glider, most of which were built by sub-contractors. The development of the all-wood Hamilcar culminated in the Mk X version fitted with two Bristol Mercury engines. Employing the operational lessons learnt from the wartime use of the Hamilcar, GALs studies projected a twin-finned, four-engined, fixed-undercarriage, pod and boom aircraft with a detachable cargo compartment. Subsequent studies evolved a substantially larger aircraft with a fixed freight compartment, but retaining the same general layout. In 1946 the Air Ministry issued specification C.3/46 calling for a medium-range tactical transport which could safely use small airfields. GAL submitted a refined version of it’s design, designated G.A.L.60 Universal Freighter, and in 1948 was awarded a contract for two prototypes. The second prototype was later cancelled. As GAL was a fairly small company, with only limited production capacity, it began looking for a partner to help it develop the design. At the same time, Blackburn Aircraft Ltd was looking for additional work to keep its Brough factory busy, and saw good future prospects in the GAL design. Consequently, on 1 January 1949 General Aircraft Ltd merged with Blackburn Aircraft Ltd, to form Blackburn and General Aircraft Ltd. It was decided that Hanworth Aerodrome, which adjoined GALs Feltham factory, would be unsuitable for initial flight testing of such a large aircraft and in October 1949 the aircraft was disassembled and transported by road to Brough. Reassembly posed a few problems, as the nosewheel had to be raised-up off the ground to keep the tail fins from touching the hangar roof. A simple unpressurised aircraft with fixed landing gear, the G.A.L.60 (WF320) made its maiden flight from Brough on 20 June 1950. Flight testing went very well and the aircraft was soon passed to A&AEE Boscombe Down for handling trials. These, and other tests, were very successful and a further prototype to an improved design was ordered. The second aircraft (WZ889) differed in having Bristol Centaurus engines in place of the original Bristol Hercules, a redesigned rear fuselage, and an enlarged, more angular, tail-boom to provide passenger accomodation. The rear cargo doors were also changed. The first aircraft had been fitted with rear freight-loading doors hinged at about 30 degrees to the horizontal, together with a hydraulically powered ramp which took some 2.5 minutes to lower. The second aircraft had much larger clam-shell doors with an almost vertical hinge line. These doors could be removed to drop large stores. Also, while the first prototype had large single main wheels, the undercarriage of the second aircraft comprised double wheels on the noseleg, and four-wheel bogies on the main legs – a combination more suited to the rough field operations expected in service. Construction of the second prototype proceeded rapidly, using many components from the cancelled original second aircraft. Designated G.A.L.65 by General Aircraft and B-100 by Blackburn Aircraft, it first flew in June 1953 – by which time an initial order for 20 production versions had been placed, under the designation B-101 Beverley C.Mk 1. In May 1954 an RAF order for additional aircraft was placed, the eventual total being 47 production aircraft. Several projects for civil versions were also contemplated, including cross-channel car ferry with two decks – but none were produced. The Beverley was a cantilever monoplane design with the wing mounted on top of a huge two-level fuselage linked to twin fins and rudders by means of an extension to the main fuselage. The two deck fuselage comprised a freight hold of nearly 6,000 cu ft (170 m3) capacity, and a passenger carrying tailboom with accomodation for 36 troops or 30 paratroops. The engine nacelles were mounted low on the wing for minimum drag and optimum cooling. All the engines and their accessory bays were interchangeable. The engines drove 14 ft (4.27 m) diameter four-bladed Rotol constant-speed reversible-pitch propellers. The trailing edge of the wing carried large slotted trailing edge flaps, electrically controlled and synchronized. The nosewheel undercarriage was fixed and the main wheels were situated directly beneath the inner engine nacelles and linked to the fuselage sides by two horizontal fairings. The production version featured some detail modifications – the most noticeable of which were the absence of a nose-mounted flight test instrumentation boom and the adoption of tapered main landing gear strut fairings in place of the previous straight ones. The first production Beverley C.Mk 1 (XB259) made its maiden flight from Brough on 19 January 1955. This aircraft and the second off the line were retained by the manufacturer to carry out additional flight testing. The second pair of production aircraft were flown to the Aircraft & Armament Experimental Establishment (A&AEE) at Boscombe Down for acceptance testing and paratrooping trials. The second production aircraft (XB260) used a temporary civil identity (G-AOEK) during late 1955 when it carried some heavy drilling equipment from Qatar to Oman for the Iraq Petroleum Company. 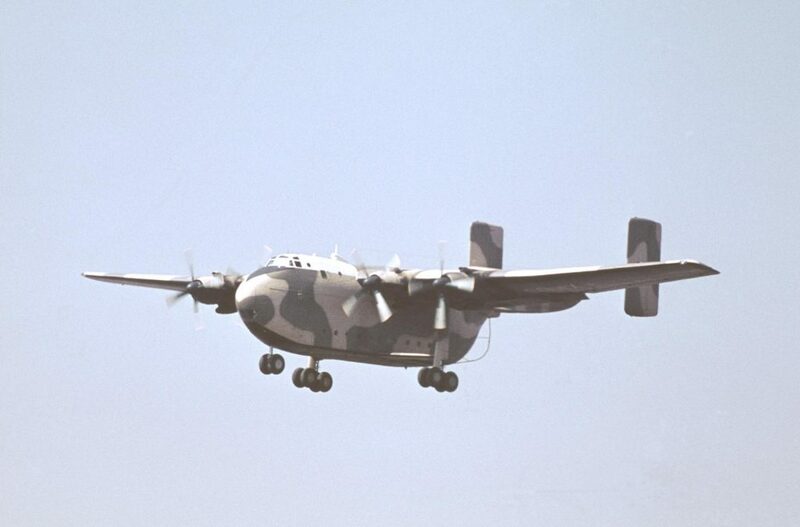 Hot weather trials in Tripoli were followed by cold weather trials in Canada, and on 12 March 1956 the first Beverley was delivered to No.47 Squadron RAF Transport Command at Abingdon. From January 1957 sister Abingdon unit No.53 Squadron also converted to the Beverley. THe Abingdon Wing soon established a regular service flying between the UK and RAF Wildenrath in Germany, and a weekly service to Aden. Aircrew training was undertaken by No.242 OCU, which operated two or three Beverleys for ten years from Dishforth and later Thorney Island. In April 1957 a third Beverley unit was established, No.30 Squadron. 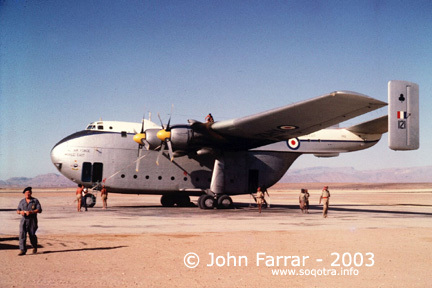 This unit moved to Eastleigh Airport, near Nairobi, Kenya in November 1959 and remained there until September 1964 when it moved to Muharraq, Bahrein. From here it ran scheduled services around the Gulf coast in support of UK air and ground forces until it was disbanded in 1967. No.84 Squadron was based in Aden and operated the Beverley from June 1958 on short-haul Army support missions. In Singapore No.48 Squadron operated a Flight of Beverleys, which became No.34 Squadron on 1 October 1960. 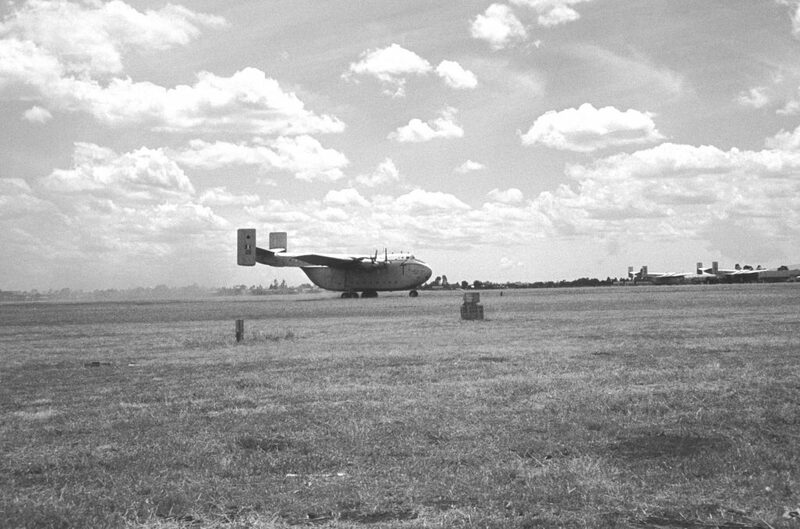 The unit flew supplies throughout the region during the Malayan Campaign 1962-66. 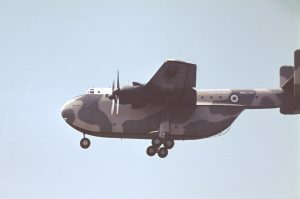 From early in 1965 many Beverleys were flown back St Athan in Wales to receive a camouflage scheme of brown and sand with black under surfaces. Originally it was intended to fully camouflage the entire upper surface, but the heat build-up in the cockpit area during overseas operations made it intolerable for the crew, so the cockpit roof remained white in order to reflect the sun’s heat away. Right from it’s entry into service, the Beverley was worked hard flying supplies to British Forces and on disaster relief missions around the world – often operating in arduous ‘hot and high’ conditions. Although possessing an impressive load carrying capability, and very good short field performance the Beverley was slow and lacked range: when carrying a full load the range dropped off considerably. It was perhaps inevitable then that as Britain progressively withdrew from it’s overseas bases during the late 1960s, faster and longer-ranged aircraft would be needed which weren’t dependent on numerous intermediate staging posts. 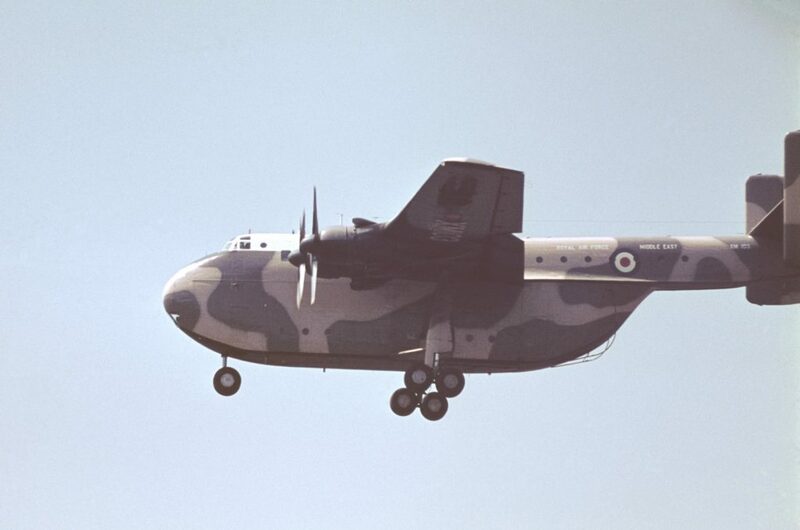 The arrival of the Lockheed Hercules precipitated a rapid phase-out of the Beverley from early 1967, with many aircraft being flown directly to 27 MU at Shawbury for scrapping. The last aircraft were withdrawn in December 1967 when No.34 Sqn disbanded and it’s aircraft scrapped in Singapore. However, three examples avoided the beakers axe and managed to survive into the 1980s. XB261 was acquired by the Southend Historic Aviation Museum, but when the museum closed down it was sold to the Moat House Hotel at Southend and then scrapped a short while later. XH124 was put on display at the entrance to the RAF Museum Hendon, but was not safe even at this prestige location. In a (hopefully) unique display of neglect and incompetence, the aircraft was allowed to deteriorate to such a state that in 1990 it had to be cut up for scap. The sole survivor was now XB259 of the Museum of Army Transport at Beverley, East Yorkshire. However, in the summer of 2003 this museum was forced to close down, and on the weekend on May 22-23 2004 the last complete Beverley was dismantled and transported to Fort Paull Museum to the east of Kingston-upon-Hull. Here it will be re-assembled and put on display to the public again. 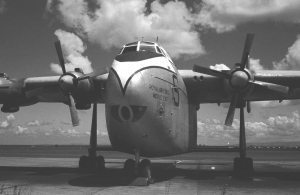 G.A.L.60 Universal Freighter General Aircraft Ltd-built first prototype (WF320). Rounded fuselage, single nosewheel & large single wheel main landing gear units. 2,020 hp Bristol Hercules 730 engines. G.A.L.65 Universal Freighter Mk 2 Brough-built second prototype (WZ889). 80% redesign with squarer fuselage, enlarged tailboom, larger vertically-hinged cargo doors. Double nosewheel and 4-wheel bogie main undercarriage units. 2,850 hp Bristol Centaurus 661 engines. B-100 Blackburn (Brough) designation for G.A.L.65. B-101 Beverley C.Mk 1 Production version. Detailed changes, including tapered main landing gear strut fairings. 2,850 hp Bristol Centaurus 173 or 273 engines. showing the original rounded rear fuselage. Engine(s): Four Bristol Centaurus 661 radial engines of 2,850 hp (2125 kW). Performance: Maximum level speed 239 mph (385 kph) at 5,700 ft (1735 m); Max Cruising speed 226 mph (364 kph) at 12,500 ft (3810 m); Initial rate of climb 760 ft/min (232 m/min); Range 1,300 mls (2092 km) with 29,000 lb (13154 kg) payload. Engine(s): Four Bristol Centaurus 173 or 273 18-cylinder air-cooled radial engines of 2,850 hp (2125 kW). Performance: Maximum level speed 238 mph (383 kph) at 5,700 ft (1735 m); Cruising speed 173 mph (278 kph) at 8,000 ft (2440 m); Initial rate of climb 760 ft/min (232 m/min); Service ceiling 16,000 ft (4875 m); Range 3,690 mls (5938 km) at 188 mph (302 kph) with 1,000 lb (454 kg) payload, 1,300 mls (2092 km) with 29,000 lb (13154 kg) payload or 200 mls (322 km) at 145 mph (233 kph) with 44,000 lb (19958 kg) payload. Payload: 94 troops, 70 paratroops, 48 casualty stretchers, wheeled vehicles up to 12,500 lb, individual paradrop loads of up to 25,000 lb or 45,000 lb (20412 kg) of freight. * Final assembly at Brough. * First prototype constructed at Feltham, but completed at Brough. Some sub-assemblies produced by Dumbarton factory (engine nacelles, undercarriage sponsons, clam-shell doors). See the Aeromilitaria article listed below. * Comprehensive history of the Beverley. * A5-size concise profile of the type. * Detailed company history with a long chapter on the Beverley. * Unit and individual aircraft histories. With interest I read articles about the Blackburn Beverley recently. Regretfully I could not find the exact date, casualties and registration of the one that crashed in Behan-Aden in 1958. Maybe you can give me these three details to complete my collection.